Whether you do the job yourself or hire a contractor to do it for you, a drywall job is a time-consuming and labor-intensive project. Determining the size of the job and the amount of materials needed is the most important part of estimating the project's cost, but several other factors can have a major impact on the job's overall price as well. A room with newly installed drywall. The first step in pricing a drywall job is to determine the size of the area to be covered with drywall. First, multiply the total length of the room's walls in linear feet by the wall's height; that gives you the square footage of the room's wall area. If you'll be hanging drywall on the ceiling, multiply the ceiling's width by its length and add its result to the figure for the wall area. Exclude window and door openings that won't be covered with drywall; calculate the total excluded area and subtract it from the total square footage of the wall and ceiling area. The final number gives you the amount of drywall needed to cover the room; expect to buy about 20 percent more to allow for waste or errors. Variations in the type of drywall that you need to use for your job can significantly affect the price. If you want or need to use 5/8-inch-thick board rather than the 1/2-inch board typically used in residential construction, for example, the material cost will be somewhat higher and labor costs may be higher as well, since the thicker boards are heavier and more difficult to maneuver. Similarly, jobs that require specialty materials such as water-resistant, fire-resistant or noise-resistant boards are significantly more expensive. Draw up a materials list so that you can price out these costs. The cost of labor varies depending on the size of the job, the number of people doing the work and their experience. A small job may go more quickly if the contractor uses a small team that handles all of the chores, from hanging the wallboard to finishing, but a large or complex job may take less time if the team includes specialists who focus on individual tasks. The extent of finish work done by the contractor also has a direct impact on labor costs. After drywall hanging, taping and skim coating the joints between wallboard sheets takes the least amount of time; applying a hand-floated skim coat or sprayed-on texture coat has a significant impact on labor costs, as well as material and supply costs. To calculate labor costs, add the wages together, including employer costs, and calculate the number of hours to complete the job multiplying the result by the total combined hourly wages. In addition to the cost of the wallboard itself, the cost of supplies, such as fasteners, joint tape and joint compound is also a significant part of the cost of any drywall job. Some jobs involving high ceilings or difficult locations may also require the use of lifts, scaffolds or other special equipment; some contractors may charge more if they need to use such equipment, and if you're doing the job yourself and need to rent the equipment, you'll need to include rental costs in the overall price of the job. You may be able to save money by compiling a materials list yourself before the job begins, because some contractors add an administrative fee for buying needed supplies or arranging for rental equipment. 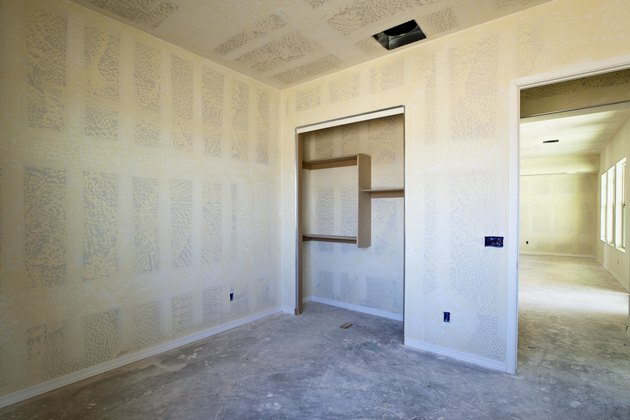 Not every room is shaped like a simple box, and unusual room designs can slow down the process of drywall installation and thus increase labor costs. High ceilings, curved walls, unusual angles, edges or mechanical systems that must be accommodated and rooms that are difficult to access are all situations that challenge drywall installers and will make the job more costly. Once you have an itemized list with prices for materials, supplies, equipment, tools and hourly labor, add these together to arrive at the total price for your drywall job. Which Is Cheapest to Install: Drywall or Beadboard?